The Waunakee Area Chamber of Commerce facilitates this lunch time networking series, Connect4Lunch as needed. In response to the Chamber survey feedback requesting 'member to member' networking opportunities, we are facilitating this series where members host fellow members for lunch at their place of business or a designated location to share information about their business, services and practices. 15-20 minute presentation by host or guest speaker; topics will be educational and informative; not a pitch for their business. The host member provides lunch and beverages for attendees, number or guests determined by the host. These small group meetings are comfortable, relaxed and personal. 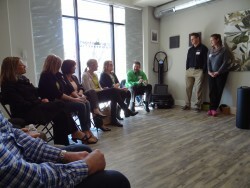 At the conclusion of Connect4Lunch you may have gained new customers, referrals, and new ideas for your business.